This entry was posted on September 11, 2015 at 11:31 am and is filed under Dating the VMs, history & provenance. You can follow any responses to this entry through the RSS 2.0 feed. You can leave a response, or trackback from your own site. A. been included in the first correspondence regarding the manuscript. And that, in turn, is a very excellent new viewpoint. I had not thought of your “B”, which is a new and I think valid facet to the argument. Thank you for giving this some thought, and for your input. Rich. Which perfectly accords with the 1637 Baresch letter. 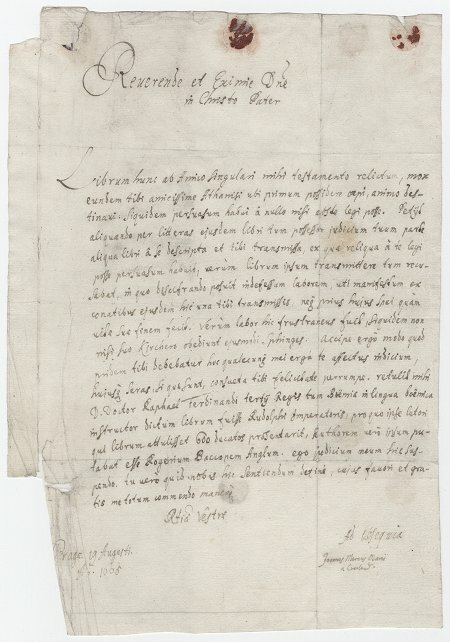 Wilfrid Voynich would have had to have seen this 1637 letter. I could this as a point in favor of the idea that the 1665 letter is genuine. After all, would Wilfrid Voynich have really had access to the 1637 Baresch letter back then? Except I find it odd that in the 1665 letter Marci does not mention Baresch by name, but just says, “This book was left to me by a close friend in his will…” which seems odd. Why not refer to Baresch by name, considering that Kircher also knew Baresch? Why refer to him as if Baresch were just some private friend of Marci’s that Kircher wouldn’t know? Why not at least say “our close friend” rather than “a close friend”? 2. Where are Baresch’s attempts to decipher the Voynich? Sure, they might have been written on a separate sheet, and maybe they got thrown away at some point as hopeless junk, but why wouldn’t have Kircher held onto them? Especially if Kircher (according to Wilfrid Voynich) held onto this letter of Marci’s and kept that in the book for all those years up to 1912 when Wilfrid Voynich “discovered” the 1665 Marci to Kircher letter in the manuscript. 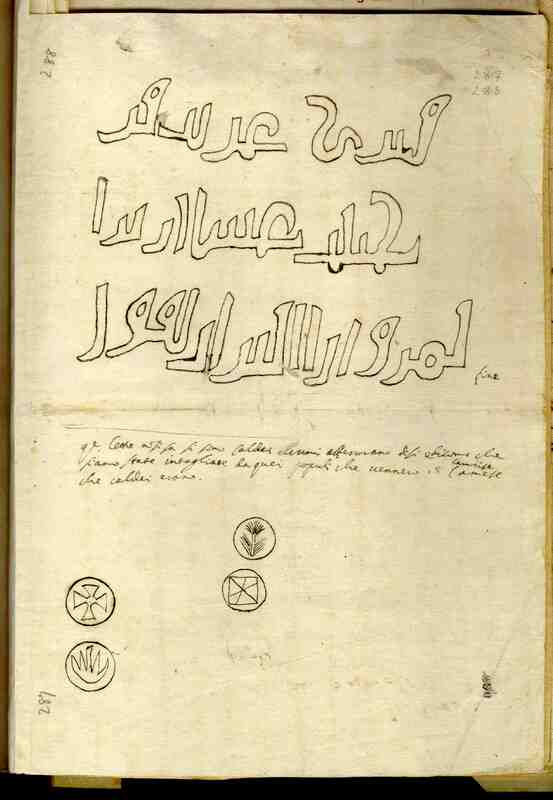 If Kircher was going to hold onto that letter, why not hold onto the decipherment attempts that were sent along with it? This isn’t a big deal, but just a little odd. Also, Rich, you are 100% correct that other Voynich scholars have devoted insufficient skepticism towards the Beckx stickers, and the fact that the one for the Voynich happened to be conveniently missing. It’s almost as if Voynich MS research needs to go right back to square one and revisit every facet of the provenance with a fine-tooth comb. I’ve thought about relating this concept a few times, and pictured doing so a placing my head on the chopping block of my critics: It is one of those ideas that has a subtlety to it, and as such, can be misappropriated, easily misstated, then thrown back at me. That probably sounds like a negative attitude… sorry, but of course I have to be careful. And that in turn is actually the good thing… this problem causes me to think carefully about the semantics of my wording, and the points themselves in fact, to come up with better explanations. In this case, a “missing link” is some element which I think my hypothesis suggests may exist, but has not been seen, and/or looked for, and/or otherwise previously suspected. But the way such a suspected element can be misused is for one to claim it is necessary for the hypothesis to work. No, the hypothesis stands on its own, I feel: But there are of course missing elements, and points which need addressing, questions which need answering, and other evidence which could help explain the hypothesis…. if it exists or did exist, that is. Here is a major one, which I’ve been thinking about while writing my Voynich/Marci letter post: It has been claimed, by my critics, that there was no way that Voynich could have seen the Baresch/Kinner/Marci letters in the Carteggio, because they were “under lock and seal” by the Jesuits. As it turns out, there is absolutely zero evidence that the 2,000 plus letters where treated any differently than those books which Voynich claims to have seen and/or bought from them. And, BTW, it turns out the Carteggio was also in the Villa Mondragone! When this was made clear, that there was nothing known to stop Voynich from seeing the letters… THAT WE KNOW OF… the claim was modified, and I paraphrase, “Well if he did see the letters, he did not have the time, and/or the knowledge of Latin, to successfully peruse the Carteggio so to find the letters necessary to forge a Voynich. It would just be too difficult and time-consuming”. I disagree to some extent… we don’t know, for instance, if Voynich may have had that access, that time… he may have. But the challenge did cause me to think about this issue, and do more work on it, and keep it in mind when doing other work on other issues. And taking this rebuttal as correct, for the sake of argument, I wondered: Could there be a “missing link” which would better explain a hypothetical Wilfrid knowledge of the Baresch/Kinner/Marci letters? Could there have been a person, and/or a work, probably unpublished, which would have contained enough information to grease the way for the creation of the Voynich, based on the letters of the Carteggio, by someone other than Voynich? Then shown to Voynich? 1) The Villa Mondragone was, at the end of the 19th, and beginning of the 20th centuries, an active and respected Jesuit college. The students were not all Jesuits, in fact, many citizens sent their sons (I do not know if daughters) there for the good education it afforded. This means there were respected professors, and respected professors… Jesuit or not… don’t get that way by spending their time in silent prayer, with blinders on, pacing dusty, dark hallways: They study. 2) Students also study, and students historically study the archives afforded to them. The archives at the College at the Villa Mondragone contained the correspondence of Athanasius Kircher. Students write student papers, too, about the things they study. 4) During part of the time which Voynich owned the Libreria in Florence Italy, 1908 to 1911, Strickand was in Florence, running a boy’s soccer club (??? I may be in error with the soccer… I can’t find that information at the moment… but he was in Florence during this time), and was politically active. Considering this, and the fact that Voynich was operating a well-known public bookstore in the city, it is not at all improbable that they knew each other at this time. So this “missing link” would be something like this: Strickland would have known that the Villa Mondragone contained the Kircher Carteggio, of course. Perhaps then there was also some knowledge of the specific content of the letters: either a thesis, or other report, or list of the contents, prepared by a student… Strickland or his brothers?, or by a professor, or other, at the College. Then, the mention of various works of literature in the collection would have been known, including the Baresch Manuscript, mentioned in his letter to Kircher (with plants unknown to the Germans, in unknown characters, with stars and chemical symbolism). Such information was then passed on to Wilfrid, for his interest… possibly, for his opinion, too. At some point, Wilfrid was afforded access to the collection, by Strickland or other… or to the paper prepared about the collection. This “missing link” would address concerns about Voynich’s ability in Latin, and the thought that he may not have the time and/or ability to find this information directly, himself. It is not, in my opinion, strictly necessary that this information exists, but it is, also in my opinion, implied by the chain of events as we know them. As for your other point, where are Baresch’s attempts to decipher the letter… that concern hinges on the belief that the “Baresch Manuscript” (as I call it, as we do not know that this IS the Voynich)… it hinges on the belief that the Baresch Manuscript was some sort of cipher or code writing, as the Voynich appears to be. However, Baresch only writes of “unknown characters”. This is another point I have made: What would have been “unknown” to a 17th century scholar is quite different than what would have been unknown to someone in 1908. That is, most of the scripts that would have baffled Baresch, Kinner, Marci and even Kircher, have long since been understood. So the Baresch Manuscript, whatever it was, by all odds, is something that by now is probably known and readable. If that seems a stray, wild, thing to claim, then think of it this way: What are the odds that one of the many scripts not known to these 17th century men, just happened to be one that no one can read, today? No, I think it far more likely that someone reading about this “unknown script” had to create an “unknown script” in the 20th century… and we were plum out of them. One had to be invented, that is. I hope I explained that OK, so you understand my point there. Thank you for the responses, Rich! Your “missing link” idea seems plausible. I had no idea that Wilfrid Voynich’s relationship with the Villa Mondragone in the time before the revelation of the Voynich MS was so…incestuous (in terms of having a close friend running the place). Nowadays, that would NOT fly. If a rare book dealer popped up with a book for auction from a library that his close friend owned, there would be all sorts of questions. (Even more questions if the book dealer were flatly unwilling to disclose his source, as Wilfrid Voynich was during his own lifetime). I find it unbelievable how much people were willing to take Wilfrid Voynich’s word on things back then. I mean, people even thought it was okay to let him continue to traipse around with the original copy and do destructive amateur chemical tests on it. I guess we live in a different day and age now. Nowadays, such antics would immediately call into question an artifact, and any respectable artifact dealer would immediately put the original copy in some sort of scholarly third-party escrow or museum curating while he pitched a carbon-copy to would-be buyers. Would it be possible to carbon date the Kircher letters, especially the 1665 one? Imagine if all of them turned out to be dated to roughly around the dates listed on the letters, except for the 1665 one…what a bombshell that would be! Especially if the 1665 letter dated from significantly after 1665, then it would be a more modern forgery for sure! But even if it dated to significantly before 1665, one would have to explain why Marci would use new paper for all of his other letters to Kircher, only to happen to use a piece of already dingy old paper for the 1665 letter. Hi: I have wondered, myself, why Voynich… and this ms. in particular… was not suspected from the start. “A different time” explains some of it, with the initial judgments carrying through to today, with a marked absence of real critical thinking in this area…IMHO. But that being said, there are many hints that it was not always so… I cannot find specific source material impugning his reputation, or any work he owned or sold… save the one forgery he did sell.. but have seen many related thoughts on the subject… many “what ifs” over the years. Then it was not until a 1986 article in Cryptologia that the question was raised in print. I can’t go into more here, but it goes much further than this work, and what people think, or what they know, about it. The broader picture includes many questions about Voynich, his time, and many other works owned by him and his associates, and so on, and the world of forgeries in general, at this time. But that is another whole can of fish. Suffice it to say that there I believe there is quite another reality than the one known or accepted today, that has not been properly assembled all in one place. As for carbon testing the letters, or any other items, that is another subject that I won’t publicly comment on in any detail… although of course it would answer many questions. First of all, it would not be desired, on the part of the owners of these things, to do such tests… for many reasons. But also, it is not… I don’t think… necessary, because there are many other ways to make a better circumstantial case here, without further tests. That being said, I do believe I have already made a fine circumstantial case, which is clearly concerning to many… we are at a crossroads in this research, that is… and a large schism has developed, with different groups locking down their positions on this issue. Going forward, that is a good thing for me, in a sense… while the effort has been to freeze the research in a desired outcome, it will actually have the opposite effect… the genuine paradigm, I mean, can no longer properly address these anomalies and concerns, but it cannot survive… I do not believe… by attempting to end the discussion. It only means that progress will only be made in with the alternatives. And for some reason his spam filter rejected my comment! I really want Nick to see this and engage with it, so I wonder if you could repost this on Nick’s site for me (since you seem to be able to post on there)? Thanks! 1. Almost all of the words of the Voynich are a very small “edit distance” away from three core words: dain, ol, and chedy. 2. Words within a line and words in adjacent lines are more likely to have smaller edit distances. 3. There are a small number of predictable rules for “allowed” (observed) variations stemming from the three core words. Then there’s Brian Cham’s “Curve/Line System”. Then there’s Jorge Stolfi’s “Crust/Mantle” paradigm. 1. I agree with you that the Voynich Manuscript cannot possibly be a monoalphabetic single-substitution cipher of a natural language. No natural language behaves like this. The Voynich Manuscript is too highly ordered, and there are too many possible combinations of words that DON’T appear simply because the edit-distance rules prohibit it. For example, one could write “defminka” (EVA transcription) in the Voynich alphabet. The Voynich alphabet has all the letters for it. Something like that COULD be a perfectly legitimate word. But you will never find anything like that in the Voynich manuscript because it happens to be too many “edit-distances” away from the three core words. Why only three core words? 2. The Voynich Manuscript could be encoding music. That’s the only thing I could think of that would fit with the three-core-word paradigm and the highly-orderedness of the text, such that words within lines and lines tend to repeat themselves with very slight variations in between. I know that others have surmised this as well. Perhaps the three core words denote something like certain octaves of C, and the edit-distances away from the core words denote pitch distance from that octave of C, rhythm for that note (eighth, quarter, or half, etc. ), and/or other special things for each note? This is the only possibility that I can think of that ISN’T a hoax that would explain the repetitiveness of the text within lines and between lines. 3. The Voynich Manuscript might be a hoax. You say that the “flatness” of the text goes against this, but Torsten Timm points out in his paper how it would be very easy to produce text that is seemingly random and nonsensical but also ordered, just by starting with three core words and doing many different variations on them following certain edit-distance rules. Right now, I lean towards hoax. Still split between “ancient hoax” (c. 1400) of nonsense text, vs. “modern hoax” (c. 1910) of nonsense text using old vellum. Rich SantaColoma’s work is something I eagerly anticipate this coming year. And I would find your take on things in this new year of 2016 fascinating IF you would perhaps see it worth your while to engage with the Torsten Timm paper in particular (and perhaps Brian Cham’s work linked above) and, if you disagree with their arguments, explain a little more fully what you find lacking in their arguments. Then I and a few others might be persuaded to back off from the hoax idea. P.S. when I tried to submit this comment, it triggered the website spam filter. That kind of frustrating…..
Hi, Citizen: It is possible that Nick will see your post and comment. I know it can be difficult to pass the filters over at his site. As for my future work on this idea, thank you for your support. I have much “in the hopper”, and I think that I can be very productive on a few fronts in the near future. Many doors in Voynich research have closed down in response to my advancements on the Modern Voynich hypothesis. Like no other theory, it has caused a great disruption… a schism… in this whole field. Many “genuine 1420 cipher herbal” adherents have withdrawn from the debate in protest, and will no longer discuss this probability. To me it is a golden sign that it has real value, to others and not just me (us? ), because it seems to worry many genuine theorists a great deal more than any other alternate theory that has come along in the last 100 years. Thanks as usual for your comments. Thanks Rich! Can’t wait to see what you have cooking “in the hopper” for the new year! By the way, I was able to edit my post to get it past the spam filter on Nick Pelling’s website.